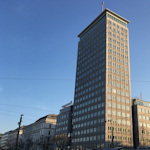 The Ringturm’s construction had more than just practical value as the new headquarters of the Wiener Städtische insurance company – it was a symbol of the reemergence of Vienna from the long shadow of WWII. First, the 23-floor tower replaced one of the buildings that allied bombing destroyed. Second, US skyscrapers (with all their economic and political symbolism) inspired the architectural approach – the then CEO of the company had spent time in US exile. And 1955 was also the year Austria gained its independence from the allied occupiers. At 73m high, with the light mast reaching up another 20m, the Ringturm is the second-highest building within the Ring (the highest is Stephansdom). The entrance to the tower is home to free exhibitions (“Architektur im Ringturm“), typically showcasing architecture from Austria and nearby central and eastern Europe. Since 2006, every summer also sees the building’s facade covered with printed sheets to form a giant work of art. That same facade turns into a mammoth Christmas tree in December, with falling snowflakes completing the display. It’s a famous element in Vienna’s Christmas lights. The light mast at the top of the Ringturm is hooked up to Vienna’s main meteorological station. Its light display – featuring over 100 lights – changes colour and direction according to the prevailing weather forecast. So, for example, descending red lights indicate it’s getting colder and blinking white lights are a snow/ice warning. If the lights blink red, it’s time to take cover – a storm is on its way. The tower is opposite the “Schottenring” stations, which is on the U2 and U4 subway lines, the 1 or 31 tram lines, and bus 3A. P.S. The name Ringturm is not a nickname or coincidence. There was a prize competition to name the building which attracted over 6,000 entries.